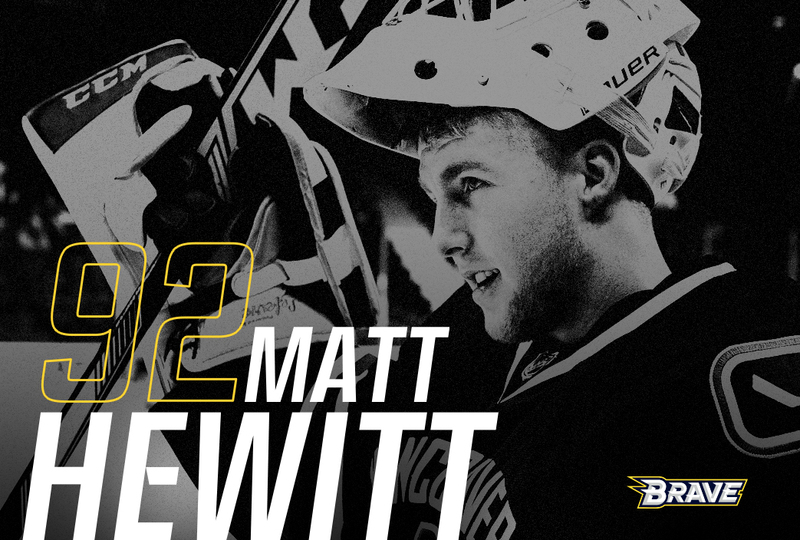 The CBR Brave are thrilled to announce the arrival of resolute goaltender Matt Hewitt from the University of British Columbia Thunderbirds. Growing up in Coquitlam, British Columbia, Matt fell in love with hockey from a very young age. He started skating at the age of 3 but it was watching his biggest role model, his dad, play that made him fall in love with the game. At the age of 10 Matt picked up the blocker that would see him stand tall as the last line of defense and lead to the experience of a lifetime. Matt joined the Regina Pats of the Western Hockey League for the 2010/11 season where he served as backup goalie to current Sydney Ice Dogs goalie Damien Ketlo. Hewitt’s work ethic saw him slowly take over the starting job for the Pats, and he would remain the starter during the 2011/12 and 2012/13 season. Throughout his time with the Regina Pats, Hewitt became one of the most productive goalies the team has had in recent years. In 2013 Hewitt joined the University of British Columbia Thunderbirds in the USports league, where he played 77 regular season games and 4 playoff games in 5 years. Hewitt joins the Brave after a career best season posting 12 wins with a 2.85 GAA and .920 SVS% as well as being named a Canada West second team all-star. When speaking about his career so far, Matt talks us through the opportunity of a lifetime, which was getting the call to be the back-up net minder for the Vancouver Canucks. On what brought him to the AIHL and the Brave, Matt touched on the experience of former team mates as well as the reputation of the Brave as motivators. “I've had a few teammates that I've played with from the past such as Damien Ketlo who played in the AIHL and they all had good things to say about the experience, so I thought I should look into playing overseas and that’s when I got in touch with Coach Rob and [CBR Brave] management. I've heard nothing but great things about the CBR Brave organization”. The signing of Matt Hewitt is a significant addition for the Brave as they look to go one better in season 2018. Is this the piece that has been missing in the Brave’s pursuit to reach the pinnacle of the AIHL?